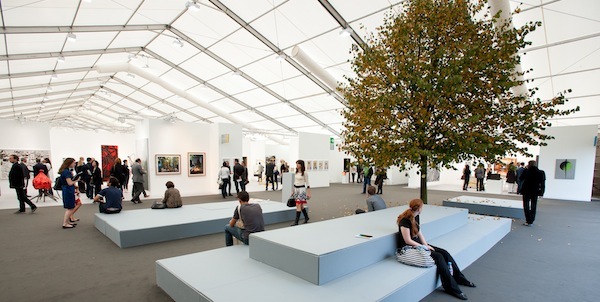 Exhibition Stands, Exhibition Stands UK, Exhibition Services | 200m2 | Exhibition Stand Freeze at Frieze London! Exhibition Stand Freeze at Frieze London! According to an article in Journal des Arts, this year’s Frieze London exhibition will see 15% fewer exhibitors this year. When I read the headline this really concerned me… it’s never good to see an exhibition shrinking! My fears were soon allayed however! It seems the organisers of Frieze London want to focus on quality and not quantity! What’s more, the size of the exhibition stands will be reduced to leave more room for visitors to circulate. 150 exhibitors are to feature in 2013 compared to 175 in previous years. I have to say that I welcome moves like this. All too often, exhibition organisers focus on the wrong metrics to demonstrate impact. The ‘visitor experience’ is all important. If an exhibition as a whole provides a poor visitor experience, visitor numbers will decline over time. The fair’s ambition, however, remains unchanged. In addition to being able to see and buy art by the world’s leading artists, visitors can experience ‘Frieze Projects’, the fair’s unique and critically acclaimed programme of artist commissions. This year’s Frieze London takes place inside a bespoke structure in Regent’s Park from the 17th to the 20th of October. For more information, visit http://friezelondon.com or call 0871 230 3452 to book your ticket! If you are thinking of exhibiting this year or in 2014, why not have a look at our modular exhibition stands. Works of art in their own right, our modular systems are perfect for displaying all forms of art! Next Next post: Free Exhibition Stands at Apps World London!